I promised more photographs from the Packhorse Fair. 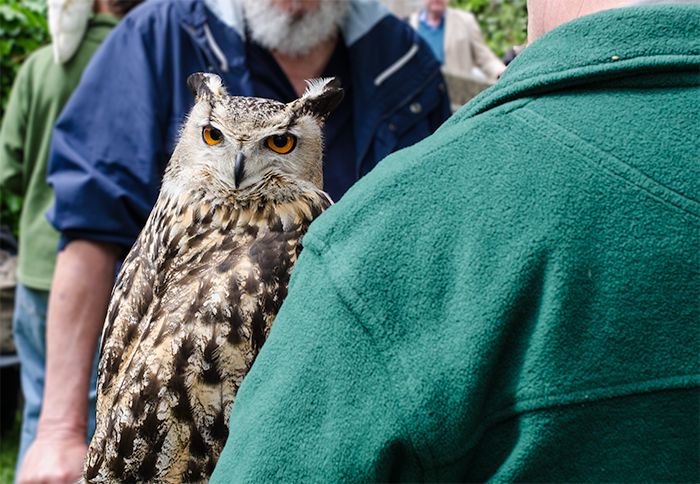 Here’s a nice shot of what I believe is a European Eagle Owl, being remarkably calm and well behaved, in spite of the considerable attention he/she(?) received on the day. 'Couldn't help but wonder just how it sees the world with those high-powered optics it comes with as standard. Of course, I would hardly be the first to have that thought. The notion of the ‘wise owl’ is one that goes way back in our culture, due, no doubt, to its intense gaze and our predilection for anthropomorphising.